A brand new FUT event is being released this year. 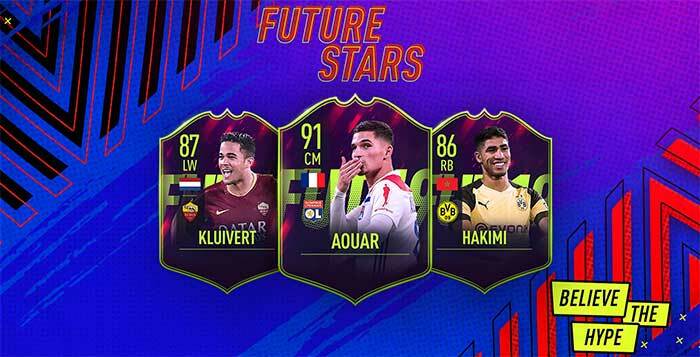 The promo FIFA 19 Future Stars is based on hot young prospects, who are released in packs with upgraded ratings and stats. The brand new FUT event FIFA 19 Future Stars was officialy announced by Electronic Arts in its social channels. The ratings of these cards are based on the potential future ratings they may reach while on the top form of their professional careers. Inspired by the FIFA Database each FUT Future Stars’ rating is based on what a player could become if they live up their hype and fulfill their potential in the future. 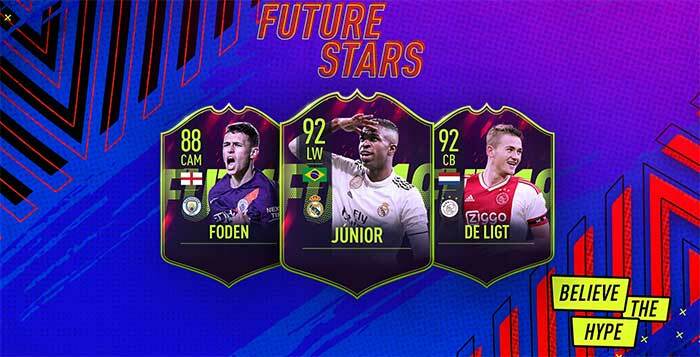 No other FUT card features a so high upgrade as the FIFA 19 Future Stars cards do. Compared to their NIF items, the ratings may increase up to 20 points (!). Contrary to dynamic cards, these item do not change after being released. They are released in packs,d SBCs and Objectives with their unique ratings. 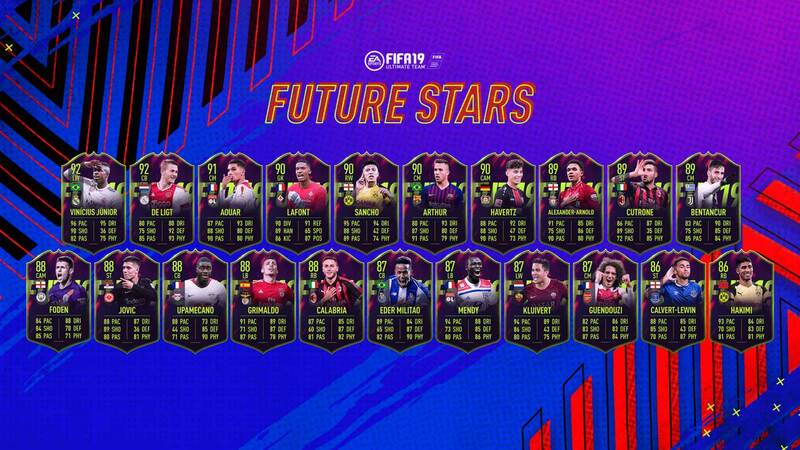 The FIFA 19 Future Stars cards are assigned to a very limited selection of 21 players and will be available in packs from Friday, January 18 (6pm UK time) to January 25, 2019. During this week, they replace the corresponding regular card. In other words, in the week a player gets his ‘FlashForward’ cards in packs, it is impossible to find his NIF card there. Throughout the event 6 more Future Stars will be available through SBCs and Objectives. The final Future Star will be decided by you, the FUT community. Fan’s logging into FUT between 6PM UK Saturday 19th January & 6PM UK 21st January will get to decide who should become the Fan’s Future Star by casting their vote in a special Player Pick. During the FFS event, there are several offers available, like promo packs available on the FUT store, special SBCs and themed objectives. We will publish them all on this page. I don’t know how to complete the fut goals objective. I’ve won games on online singles match and division rivals, both using and scoring with future players but still says 0/3 wins. Any ideas? Same problem here. How to fix it? Do you reckon odoi will get one ? Or is this all the players ? I play a 4-3-2-1 but change it to a 4-2-3-1 with the LAM and RAM. Foden played 2 games and scored 2 and assisted 3. David Silva played 6 games and scored 3 and assisted 3. It’s not easy to choose the best one. I suggest that you keep play with both until you decide which one is the best. Do you think joe Gomez will receive a card? The only reason why he is not in our predictions is because we already have Trent Alexander-Arnold and don’t know if EA will use more than one player per club. Should I wait to open rivals rewards until Friday in order to increase my chances of getting one of these cards? In this specific case, because we are talking about cards with high chances to be packed, you are probably right.